The warm autumn weather was rudely interrupted by a huge deluge that flooded roads and businesses at the end of September; the water was quickly cleared but it took longer for some of the electronic and telephone systems to recovery. The warm dry days of October can be misleading but David, the estate manager, is planning for winter and is busy liaising with MITIE about the winter gritting programme. Essex like many other County Councils does not have the resources to grit every road in the county, and whilst they grit the busy Freebournes Road, the feeder roads to the businesses on other parts of the estates can be difficult and dangerous in severe weather. WIW also has to allocate its funds carefully so a director and the estate manager check the forecast and the risk factors before instructing MITIE to grit roads on the estates. 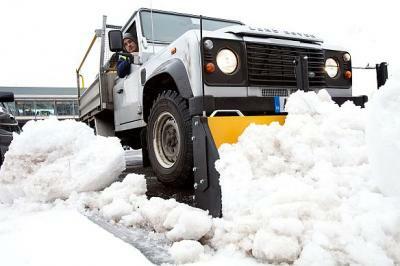 Gritting at the right time is paramount to its success, especially when snowfalls are forecast.